The state Department of Education and the College Board released the 2014 SAT results this week. New Canaan High School students had the fourth best SAT scores among Connecticut public high schools in 2014, according to data released this week by the state Department of Education and the College Board. On par with state and national results, the numbers are essentially flat compared to 2013, even though the school's students taking the test were ranked fifth last year. In 2012, New Canaan was ranked second. Local students' cumulative score in math, writing and reading was 1,771, compared to 1,774 last year. Darien High School students ranked first with 1,799. Interim Superintendent of Schools Bryan Luizzi commended students for keeping New Canaan among the top ranks of state SAT achievement, but noted the SAT is one many sources the district uses to evaluate its performance. "The performance is consistent with the last year or two," he said. "We're always looking for ways to improve our program and this provides us with one data point." New Canaan seniors scored 583 in critical reading and 594 in each math and writing. The average score for all public school seniors in the state was 499 for reading and 500 for each math and writing -- a combined 1,499. The U.S. average was 1,497. Both number are statistically flat compared to last year and they fall short of the 1,550 score that the College Board deems as "college ready" and not in need of taking a remedial course. A perfect score would have been 2,400. "We are reflecting a little bit of our national trend," Luizzi said of the New Canaan's static score. "Usually, we don't get too excited about a couple of points up or a couple of points down." Students in Wilton and Weston came in second and third, respectively, Westport's Staples High School ranked fifth, and Ridgefield sixth. Besides being in Fairfield County, the top six schools also are members of District Reference Group A. "That's a group that we respect and we feel honored to be part of," Board of Education Chairman Hazel Hobbs said. DRGs are collections of schools grouped together for comparison based on the district's enrollment and the students' socioeconomic status. "It's another indication that this is a highly competitive and successful group of schools," Luizzi said. "When we look at our performance, these are the schools we are looking at and we are working with." 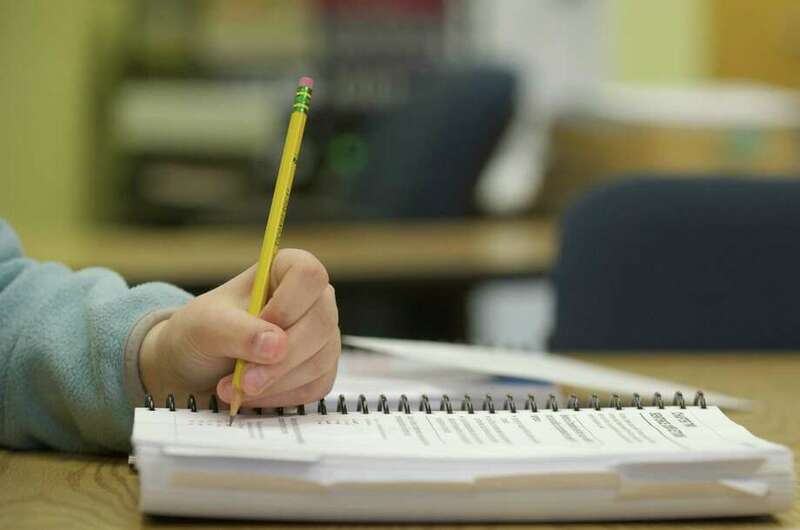 Last year, New Canaan students' reading and math results were the lowest in five years. This year, the reading score improved by five points, but the math score slipped nine points. Although New Canaan still is among the top five, Hobbs said there is always room for improvement. "We feel that we're doing a terrific job, but we can always do better," she said. "That's something that New Canaan has always had as a goal." Luizzi also noted that the top scores "are in a tight band with each other." New Canaan students scored 24 points lower than those in Darien, who were only four points ahead of Wilton. Hobbs said that it's been a good year for the high school. In September, 10 high school juniors were named semifinalists in the annual National Merit Scholarship Program, a prestigious scholarship partially based on the PSAT -- a preliminary SAT administered to juniors. The SAT's margin of error and the number of test takers -- 279 students in New Canaan -- should also be taken into consideration, Luizzi said. Increasingly, more New Canaan seniors have opted for the ACT. In fact, the SAT has been losing ground to the rival ACT across the country, perhaps because it faces its second major redesign in as many decades. In 2005, the SAT added a writing test and went from a 1,600-point test to 2,400. In 2016, the essay will become optional, points won't be deducted for wrong answers, obscure vocabulary words will be scratched and the test will revert to a 1,600-point scale. The idea is make it more aligned to skills students are expected to know in order to do well in college. Even as the number of high school seniors taking the test increases to more than 1.67 million for the Class of 2014, the number of colleges making the submission of an SAT score optional grows annually. At last count, there were more than 800 higher-education institutions nationwide that make SAT submission optional, according to FairTest, a group highly critical of standardized tests.